21stcenturylearning | Life Long Learning! Based on an informal survey among my colleagues, there is a significant shift from desktops to laptops for classroom teachers. In addition the trend is toward the use of LCD projectors, sound systems and document cameras . The primary focus of these digital tools will how they will directly impact instruction. Teachers love the mobility of the laptop and how lessons are enhanced by the highly visual and interactive document camera. The potential for engagement of the students will be incredibly powerful, as our children live in a media-rich world and rely heavily on visual sources for information and understanding. As these tools help us shift the use of technology, particularly the computer from a productivity tool to an instructional tool, there are a few important things to consider. The teacher’s computer is no longer strictly a productivity tool. Initially, classroom teachers’ laptops along with the docking station will be placed on their desks. Many teachers have their desks positioned in the back of the class and out of the way of the students. However, in a few months, the docking station will also be connected to an LCD projector, sound system and a document camera. Teachers may have to rethink the placement of their desks or come up with an alternative surface to place the laptop/docking station so they can be in a position to interact with the students and allow for optimal classroom management. You don’t want to be projecting media from the back of the class and talking to the backs of your students’ heads. The addition of this new technology into instruction will require a great deal of flexibility and “thinking outside the box”. It’s important to recognize how students become actively engaged in the learning process when visual media is used to reinforce concepts, and support comprehension. The availability of the Internet creates endless possibilities as teachers access images, video, maps, graphs, virtual tours, and other primary resources. In addition, access to teacher examples and student work helps visually demonstrate the process for writing, solving a math problem, or doing a science experiment. Keep in mind that students can lead instruction by using the document camera to manipulate objects and explain what they are doing. Using technology to devote more class time to students demonstrating their thought process, sharing their work, and gaining confidence in their abilities directly impacts student achievement. There are so many wonderful examples of the digital tools of the 21st century classroom. I can email you some handouts that I’ve obtained from other schools if you want to explore this topic further. In addition, if you teach in a classroom that already has these tools, please email me your reflections about how they have impacted your students’ learning. I would like to compile some documentation about some of the great things our district teachers are doing with technology to enhance instruction! I always find the statistics surrounding social media really compelling. Every time I see an article relating to the growth of social media I bookmark the article or presentation. I always want to be ready to state the facts surrounding the trends in technology to my peers in education – as many seem to be unaware of what’s happening and understand the full impact on our society. I’ve found a widget from Gary Hayes’s Blog the provides a pretty powerful visualization of the growth of social media, mobile technology, and gaming. I’m not sure how these figures are calculated but I find it pretty amazing. I’ve been to the website, The Partnership for 21st Century Skills. The best way to explain this organization is to check the About page on the site. The resources available from this organization are quite significant. The workshop was introducing the latest in a series of curriculum maps the outline concrete examples of best practices in Science, Social Studies, Geography, English, and Math. These documents are definitely worthwhile for any teacher or administrator who is making decisions on shifting the learning environment to gain relevance in these changing times. The curriculum maps are a little hard to find. Here’s the link to the page with all publications – scroll down to the bottom to find the maps. Is Web 2.0 a Relevant Term? On the third day of NECC, I attended a panel discussion led by Steve Hargadon the founder ofClassroom2.0. The panel consisted of 6 educators who are pretty well known in the educational technology world. The general theme was to explore the topic of Web 2.0 and how effectively it’s being used in schools. Each of the panelists, along with many people in attendance are heavily involved in social media, using blogs and wikis, and belong to a huge Twitter community of educators. The discussion was met with some push back from an attendee. The panel was asked to define Web 2.0 and was chastised for focusing on the backchannel. It became quickly apparent that not everyone that not everyone was up to speed with the terminology and the impact on education social media has made. I’m not even sure if anyone who would be considered a “newbie” got the point of the whole discussion. It’s the push back that helped me learn. Those of us who have been involved in social media, blogs, wikis, Nings, Twitter…have to understand that the terminology is confusing and the concept can be overwhelming. One doesn’t learn Web 2.0, and there is no real definition – only characteristics. The fact of the matter is at this point in time, the web is the web user created content so prevalent that anyone who uses the Internet uses Web 2.0. Check your email using Yahoo? Yahoo news features articles that have had the most “votes” and accepts comments on articles from the readership. Purchase anything from online stores like Amazon or Target? Other shoppers can create lists and comment about and rate comments. Looking for recipes? All Recipes is an extremely popular website that accepts recipes from members of the site along with allowing it’s users to organize their favorites. 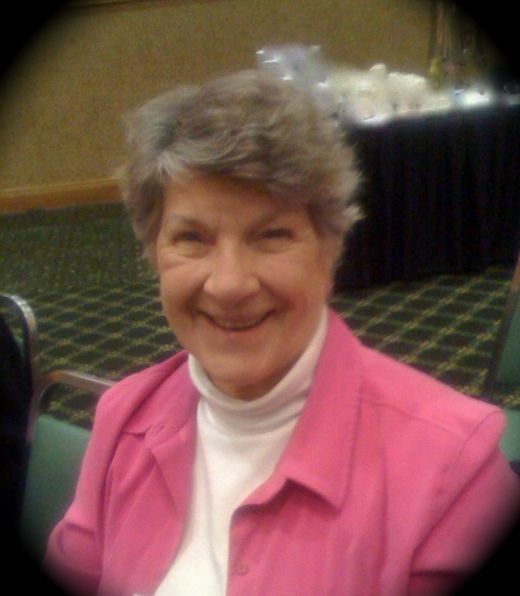 Do you have family members that share photos online? Sharing photos online is a great example of a practical use of social media. Have you ever seen a YouTube video? As of earlier this year, YouTube has 100 million viewers. That amounts to about 15 millions videos a month. Have you used Google to research any topic, particularly pop culture or current events? If you access any Wikipedia article, you are accessing a site that is based on the “wisdom of the crowds”. My intention is to write about the many things I learned about NECC09 in separate posts, but I’m writing my “wrap up” post first. This is my second attendance at NECC – the first being in Chicago in 2001 as a new technology teacher. That conference was a blur for me since it was my very first experience of any ideas, concepts, or tools in the ed-tech world. I do remember being so extremely excited about all I learned that I created a 4 inch 3 ring binder with handouts and went through them with my principal in a meeting the summer before I started my position as technology coordinator. I must have been pretty enthusiastic and passionate during that initial meeting, because she spent the next several years quoting me, asking me to revisit things she heard me mention, and basically letting me develop an awesome technology program. I didn’t meet many people and I made no lasting friendships, but I saw amazing presenters (including Steve Jobs) that were influential and help me expand my knowledge and certainly my enthusiasm for all things Ed-tech. I remember being overwhelmed but not in a negative way. Soaking it all up like a sponge was more the feeling I remember. I’ve gone in to so much detail about that first conference to make a point about this conference. After working in the ed-tech world for 8 years now, what I gain from this event is very different. First of all, I keep handouts in my delicious links or in a folder on my desktop – there are no binders. That’s not the important part though. I’m not a newbie anymore and I have to carefully select the sessions I attend so that I can gain something from them. That’s pretty tricky – more on that in another post. Here’s what the Conference meant to me. I “hung out” with old friends from ICE, helping me further establish relationships that will help me with my contribution to my Illinois tech teacher community. I was able to put a face with a name for people that I know through Twitter and blogs I read on a regular basis – although I didn’t do as well with that as I’d hoped. I managed to go to several really interesting breakout sessions in a variety of topics, and although I claim to be an expert, I managed to take away something new. I validated my disdain for anything commercial. Although I visited the vendor floor, I picked up no swag and made no new contacts. I didn’t even pick up my personally engraved flash drive. (If ISTE could send that to me – I’d really appreciate it!) If you’re looking for a pen or a T-shirt, I would not be the one to ask. Being that ed-tech has been around for so many years, evidenced by the fact that the conference has been around for 30 years, was there anyone there this time that was “soaking things up like a sponge”? Did educators leave with enthusiasm and passion for new ideas, tools, and strategies? I’m in a much different place now, but I think I’ll go to NECC again. I’m still learning and I particularly like being validated by my colleagues in face to face chats and while listening to really smart presenters who I seem to connect with. Did You Know a Mac Could Do That? Carol Ann McGuire, the ISTE 2008 Teacher of the Year, and working on her current project RockOurWorld. Apple invited her to speak to a group of educators about her work with special needs students, particularly with students with visual disabilities. Among other things, she showed us a few really great video projects that her students have produced using Apple iLife. The videos can be accessed from here: Get a Clue: What We Can Do! Using the application Text Edit (small word processing app similar to Windows Word Pad) – check out the Services menu. Paste source text from a website, online book, or other text into a Text Edit document. Under the Text Edit > Services > Speech > Start Speaking Text. Let the computer read the text. Check out this screencast. Take that idea one step further. If your students needs to listen to an article at a later time, create a podcast of a section of a book or an article. Take a look at this article about how it can be done. The Text Edit program can summarize a large source text. After a set of text is pasted, highlight it, and then under the Text Edit > Services > Summarize. You can control how short the summary will be. High light a couple hundred words and the computer will summarize it into a sentence. Pretty amazing! Use this strategy to help students with reading comprehension. Perhaps it may also be a way to analyze their own writing. Use the summarize feature to check the message of an essay. Take a look at this screencast. Both these features also work with Safari. 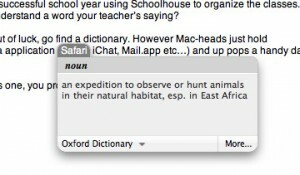 Safari can read the text of a website as well as summarize a section of text. Press and hold Apple+Control+D over any word in the Safari application and up pops a handy dandy Dictionary/Thesaurus. Check out the Zoom in Feature. 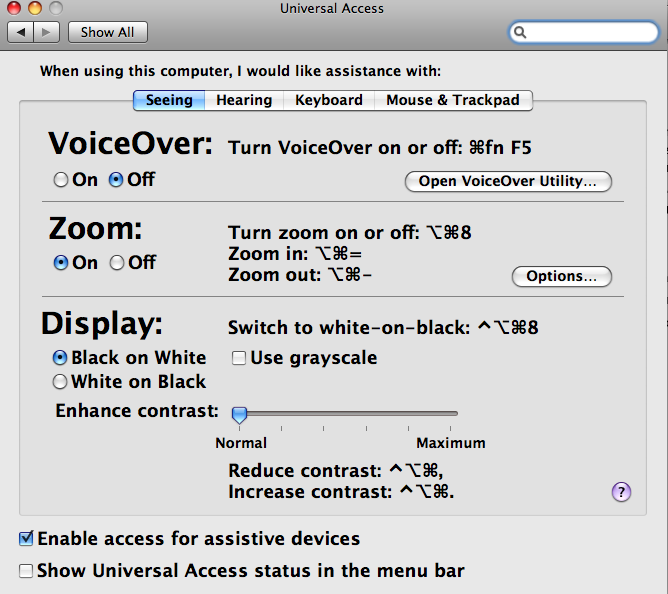 Under system preferences > Universal Access > turn on Zoom. You can also turn it on automatically by holding down option/command/8. This makes the screen zoomable by holding down option/command/+. 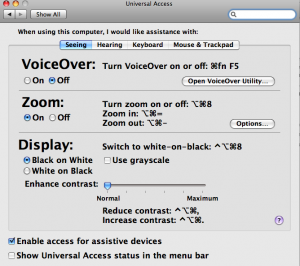 This feature is a great way to present content, but for visually impaired students the zoom feature is essential. In addition, students can adjust the display colors and contrast of the screen to make it easier to see. It’s amazing how many of these kind of features are built right into the Mac. There is an amazing capability to give your computer verbal commands. I haven’t figured out how to do it yet, but watch Brandon, one of Carol’s students explain it. Technology is a tool that adds richness to teaching and learning. It allows teachers and students to do things that would have never been possible without it. It’s not technology for technology sake – but a way to make connections, develop relationships, collaborate, and express ourselves creatively. The current curriculum should be “globalized”. We need to teach kids to be reflective and understand that everything needs to be viewed from many perspectives. He gave the example of looking at the American Revolution from the British perspective by accessing curriculum materials from the UK or even talking to a teacher or students from the UK to find out how they are learning about the American Revolution. An example from our district is requiring students from the Middle School foreign language classes to find articles about current events from newspapers and media sources from Spanish speaking countries – not just from our country’s media. Rethink Assessment and provide opportunities to create content. Find a balance between focusing on standardized assessment tools and offering students the opportunity to develop higher level thinking skills with projects and activities that ask them to create, make decisions, and work with others. In our district, we can demonstrate many examples of how kids use creativity and problem solving skills. Sometimes they don’t even use a computer – but we are prepared to help them do things like create videos too. Understand the concept of information literacy and know that using the web to find information is a complex process. With the help of the Library Media Specialist in our district, I created a presentation that combined much of the concepts from Alan November’s book as well as the Standards for the 21st Century Learner from the American Association of School Librarians. You can find that presentation here. Basically, we can’t ask students to “go find it on the web” without first considering how construct a query, locate information, and evaluate the source. Although many teachers disregard the complexity of the Internet and still expect their student to “google” everything, we are getting much better at providing better preparation for using the Internet effectively and efficiently. Based on what I learned that day, I think the change I would most likely implement is to utilize the free tools such as Skype to connect our students to the world. Alan spent a great deal of time giving examples and making recommendations about how a simple thing like a Skype call in a classroom can really transform a learning experience. We used Skype twice this year to connect our students to classrooms in Canada and Texas. I know that was a fun experience. I will look for more opportunities for other classrooms to make connections to help students understand that the world is only a Skype call away. In addition, I would facilitate more opportunities for students to create content for a wider audience – making sure that really rich projects are showcased on the web. I’ll start by showing teachers projects from YouTube, wikis, and blogs to demonstrate what is possible, then offer support so that projects don’t become “just one more thing”. I am working on a presentation for several different audiences. The theme of the presentation is “Rethinking Research – 21st Century Information Literacy”. Like the digital packrat that I am, I’m collecting documentation which validates the need for exploration of this topic in all schools. Here’s a clip from an article written by Howard Rheingold. This statement disturbs me as a teacher, as I recognize that this falls under our roll to teach students how to find information, evaluate it’s value, and understand the impact of social media on every aspect of our society. This statement really disturbs me as a parent. I know my own children are not learning any of this! Just because they can maneuver around their Facebook page doesn’t mean they realize the power of social media as a tool and as a means for expression. It was exciting to take advantage of an invitation on twitter from Ryan Bretag to look in on a discussion with a group of students on the impact of technology in education. It was a broadcast on Ustream TV. During the broadcast there many other educators in the chat room listening in and commenting on the conversation. As an educator who rarely gets the opportunity to have such rich conversations with students (other than my own three kids) I was really interested in what they had to say. In the broadcast, Ryan introduced them to a few tools such as Twitter, social networking (specifically Ning), and google docs. I wasn’t surprised that they hadn’t heard of any of these tools. Although we give digital natives a lot of credit for knowing everything, in reality, they only know the tools they use in their personal or academic life. They don’t have any more time than us grownup to go out there and seek out what’s new and interesting. That’s our job as ed-techs. The thing that really impressed me, to the point of smiling from ear-to-ear, was the thoughtful questions and comments in terms of how the tools are valuable. Twitter, for example wasn’t met with much enthusiasm at first, as far as a tool that fits in to school. When examples such as being able to use twitter to communicate with others at different schools was offered, then the students were interested. The students really focused on the value for school. How would this be used in the context of the classroom? I was really impressed that the students focused on the value of the tools in their learning environment. Ning made them nervous. Social networking is viewed as something they do in their free time. Networking with teachers? Not so much. When Ryan made it clear that Ning is a more professional tool, than the students could see the value in using it as a tool for communication and collaboration. They could wrap their heads around the value of the tool as they separated the concept from their own “facebooked world”. Google Docs was really met with a lot of enthusiasm. Many students brought up specific examples of how they would use this tool as they worked in groups. The described scenarios where emailing documents back and forth to team mates really failed, or kept them up until all hours if the message didn’t arrive right away. While I was listening in on this conversation, I was forming a plan to have a similar type round table discussion with the middle school students in my district. I run a risk because middle school students are not quite as focused and insightful as they will be in a few years. The I thought about having this kind of discussion with the teachers. With the teachers, I run the risk of getting a great deal of resistance. “Who has time?” is a question I get a lot. Also, unfamiliar tools tend to get a lot of resistance from non-digital native because we can always find fault with something that seems really new and different. In addition, in the case of elementary school, if only some teachers used the tools and most others didn’t, would all of the students get an equitable chance for exposure or utilization? Bottom line: Despite growing up in a digital world, they aren’t as familiar with the tools or use the tools as much as we believe. However, the difference is that they are open-minded compared to some of an older generation. A lot of time, we give these kids credit for knowing more than they really do, but we don’t give them credit enough for having the same kind of sense of urgency and same recognition of value of their own educational experiences.